Araragi Tsukihi. One of the fire sisters. The younger sister. The littler little sister. Second year in middle school. Born in April. Age 14. Blood type B. A hysteric. Sly. Prone to heights of emotion. And immortal, too. Tsukihi can most often be seen fighting for justice alongside her older sister. But while she claims herself to be “justice itself”, Tsukihi’s commitment to the quest for the good of all mankind is a fickle thing, and she is mostly in it for the fun. It is not that Tsukihi is indifferent to the troubles of others, it is just that she cannot keep at any one thing for too long. Her mood swings are as frequent as her hairstyle changes, and her temper is very short indeed. But no matter how her mood or appearance change, there are things that will always remain the same. She is the youngest of three siblings, on great terms with her older sister, always trying to get her older brother spoil her, and fiercely protective of them both. 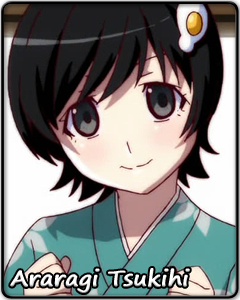 Whoever she is, whatever she is, from the day she was born, she was Araragi Tsukihi.